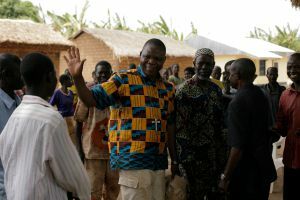 The Caritas-backed Interfaith Peace Platform aimed at ending conflict in the Central African Republic (CAR) is the recipient of the 2015 Sergio Vieira de Mello Prize. Sergio Vieira de Mello, UN Secretary General representative, was killed in the UN compound bombing in Bagdad on 19 August 2003. Every two years an award goes to an individual, group or an organisation having done something unique to reconcile parties in conflict. Archbishop of Bangui, Mgr. Dieudonné Nzapalainga, the President of the Islamic Council in CAR, Imam Oumar Kobine Layama and the President of the Evangelical Alliance, Pastor Nicolas Guérékoyaméné-Gbangou share the award, given at a ceremony in Geneva on 19 August to mark World Humanitarian Day. Ravaged by violence, the Central African Republic has experienced the worst crisis in its history. Manipulating religion for political purposes in the country has caused the death of hundreds of thousands of people and sent many more on the roads to exile and displacement. In the middle of the war, the three religious leaders acted together to address the growing unrest in the Central Africa Republic. Since then they continue to persuade Muslims, Catholics and Protestants to avoid further violence. They have been working together tirelessly to restore the social fabric of their country by addressing the root causes of mistrust in remote villages. Did the Peace Platform contribute to the prevention of conflict in the Central African Republic? The Peace Platform has helped to prevent conflicts in the Central African Republic. We warned the people of the manipulation of religion for political ends. We denounced the misappropriation of religion. We are men of words and not force. We don’t coerce, we address consciences leaving people the freedom to make their own choices. The Peace Platform acted as a sentinel – seeing the danger coming so the people were alerted. Men and women have said that us speaking out means that even if the chaos happened, the worst was avoided. Why was it important for the Peace Platform to be multi-faith? The saying goes that “one finger cannot remove live from the head”. We know that unity is strength. We need to move beyond what divides us in the search of national interests. It has been a platform of speech and expression. It has been a home for the other and for their differences. We combine efforts to seek a consensus. By uniting despite our religious differences, we show the strength of each other and the solution to our problems. What’s the situation like now? Calm is gradually returning to hearts and minds. Young people have gone back to school. Activities are resuming slowly. But the armed groups have kept their weapons. The planned disarmament has not yet begun. We are sitting on a hot potato that can burst without warning. It’s a precarious peace. The potential for armed groups to cause problems remains. The people glare at each other like angry dogs. What are the current plans for the platform? The platform continues to reach people with information. It trains peace educators. It encourages non-violent interventions by promoting dialogue between religious groups. Muslims, Catholics and Protestants working together is a symbol of unity in diversity. The platform prepares reports to spread throughout the country to support the local work and works with them to plan joint activities. The platform is also engaged with the political process to press for dialogue. What can the international community do better in crises like the one in the Central African Republic? The international community must be impartial. A voice must be given to local actors to empower them and show them trust. The international community must be proactive in prevention. It can avoid past mistakes by not imposing its own agenda. Follow World Humanitarian day on hashtag #ShareHumanity.